In a bid to be more receptive, the US Air Force has invited its members and their families to suggest a name for the next-generation bomber, known as the B-21. Still on the drawing board, the new plane is intended to replace the aging US bomber fleet. Speaking at the “State of the Air Force” press event on Monday, Air Force Secretary Deborah Lee James announced the contest, which will run through May 6. It is open to “members of the US Air Force active duty force, Air Force Reserve and Air National Guard, and their dependents, members of the US Air Force Civil Service and US Air Force retirees,” according to the official rules. After James unveiled the artistic rendering of the B-21 at an Air Force Association conference in Florida last month, Defense News conducted an unofficial poll of its readers to get feedback on some of the suggestions. Of the names on offer, “Valkyrie” was the most popular, with “Wraith” coming in second. James also named the seven sub-contractors that will help build the bomber. Pratt & Whitney of Connecticut will build the engines, while BAE Systems of New Hampshire, GKN Aerospace of Missouri, Janicki Industries of Washington, Orbital ATK of Utah, Rockwell Collins of Iowa, and Spirit Aerosystems of Kansas “will work on airframe and mission systems,” the secretary said. It is no coincidence that the artistic concept for the new B-21 bears a striking resemblance to an earlier stealth bomber, the B-2 Spirit. The USAF awarded the contract to develop and build about 100 B-21s to Northrop Grumman, makers of the B-2. Only 21 Spirits were ever built, at the “flyaway cost” of $737 million apiece, before the program was scrapped in 2000. 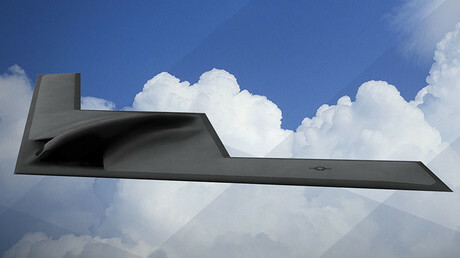 Northrop has pledged to keep the price tag of the B-21 at or below $550 million apiece, in 2010 dollars. To bridge the gap until the B-21 is built and deployed, the USAF is refitting its aging fleet of B-1B Lancers and planning to overhaul the B-52 Stratofortress bombers, which have been in service since the 1950s.